The concept of IceStone – diverting glass from the waste stream and “upcycling” that glass into a premium product- was conceived as a solution to challenges throughout the stone industry. 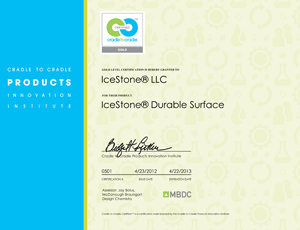 Since 2003, IceStone has stood as a pioneer at the forefront of a durable surface revolution, innovating beyond toxic resins, petrochemicals, and dangerous quarries. Few brands can match the “true” green story of IceStone, and fewer still can produce their unique composition of cement and recycled glass. Today, IceStone offers the safest and most sustainable durable surface in the world. Manufactured from 100% recycled glass and concrete under sustainable circumstances, IceStone redirects tons of waste glass from landfills every year. Remnants and Discontinued Colors available in various colors and sizes, inquire for list.